Chimpanzees are more closely related to humans than they are to gorillas. Chimpanzees and humans share 99 percent of their genetic composition. Chimpanzees are highly intelligent, probably more so than human-based tests are able to measure. They make and use tools, cooperate with and learn from each other, and can learn various forms of expression and communication, including American Sign Language and computer symbols. Chimpanzees also have good memories. Fewer than 250,000 chimpanzees still exist in western and central Africa. Chimpanzees now occupy only a fraction of their former territory. Chimpanzee habitats, already small and isolated, are being further destroyed by increased commercial and agricultural development. In Africa, both species of chimpanzees--pan paniscus and pan troglodytes--are considered endangered. The U.S. Department of the Interior also lists them as endangered. There are approximately 2,000 captive chimpanzees in the United States. About 300 are in zoos, and the remaining 1,700 were bred for medical research. Many are the offspring of chimpanzees captured in the wild before 1973, when the United States agreed to abide by an international treaty prohibiting the capture and importation of wild chimpanzees. An estimated 106,000 chimpanzees live in a range of wooded habitats in the wild. They live in 21 African countries and are most concentrated in rainforest areas. They live in social groups, with numbers ranging from just a few to over 60. Chimpanzee meat is no longer exclusively the food of the forest peoples, but is now commercially available in urban areas too. Bushmeat, including chimpanzee flesh, is also eaten by people in logging camps. The Jane Goodall Institute has very real concerns about the bushmeat trade. They say: "The large-scale commercial bushmeat trade could eradicate all great apes within 10 to 15 years." CITES prohibits chimpanzees caught in the wild being used in circuses, but in countries where CITES has not been ratified or where it cannot be enforced, chimpanzees may be taken from the wild as infants, which often means the killing of the adults in their group. Chimpanzees have been used in brain and skull research and in social deprivation studies. Chimpanzees are now popular subjects for AIDS research, although their immune system does not succumb to the virus. Chimpanzees are also used in painful cancer, hepatitis, and psychological tests, as well as for research into artificial insemination and birth control methods, blood diseases, organ transplants and experimental surgery. Their use in military experiments is suspected, but such information is kept secret and is hard to verify. Because they are in short supply, captive chimps are often subjected to multiple experiments, each of which can last an average of two to four years. Chimpanzees are highly active and very socially oriented. When kept isolated in laboratories with no regular physical contact with either humans or other chimps, they quickly become psychotic. Because adult chimpanzees are strong and often unmanageable, and because infected chimpanzees cannot be placed in zoos or existing sanctuaries, many chimpanzees are killed before the age of 10. (The normal lifespan of a chimpanzee is 40 to 50 years.) Others, perhaps not as lucky, are kept in tiny cages for decades. Any increased use of chimpanzees in U.S. laboratories must rely on captive breeding. However, chimpanzees who are taken from their mothers before the age of four or five years seldom develop the social skills necessary for normal breeding. Female chimpanzees do not begin breeding until they are about 12 years old, and thereafter do not breed at all during each baby's four-to six-year infancy. Artificial insemination has increased breeding only slightly. Chimpanzees infected with AIDS, hepatitis or other diseases usually cannot be used for breeding. Unwanted chimpanzees from zoos and circuses are sometimes sold to laboratories. Chimpanzees are still captured in the wild by poachers who shoot chimpanzee mothers and then take their infants. Many of the captured baby chimpanzees die before they reach a laboratory. Because the adults protect the infants, several adults are sometimes killed to obtain one baby. During the late 1980s, the National Institutes of Health (NIH) developed its so-called "National Chimpanzee Management Plan." This plan is, in reality, was just a funding mechanism for five breeding colonies to maintain a steady supply of chimpanzees for vivisectors. 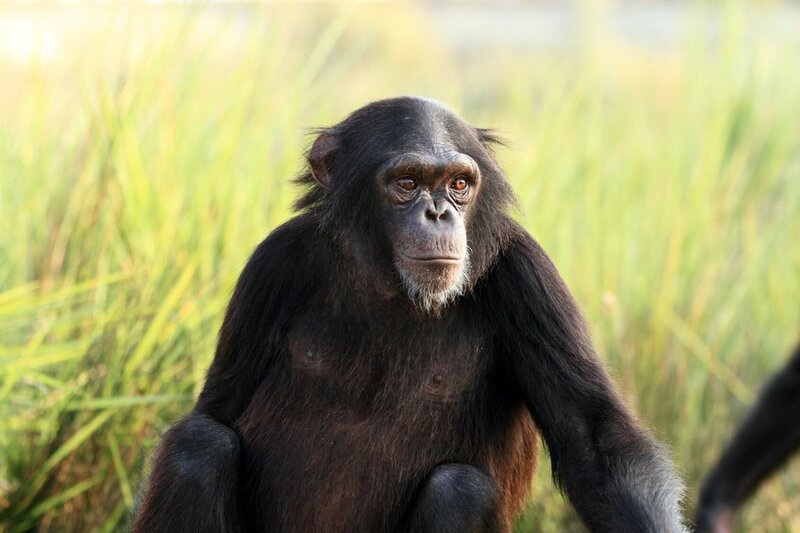 Under a series of grants, the plan established breeding colonies of chimps at the Yerkes Regional Primate Research Center in Atlanta, the University of Texas in Bastrop, the Primate Foundation of Arizona in Tempe, the University of Southwestern Louisiana in New Iberia, and New Mexico State University (NMSU) in Alamogordo. The Chimpanzee Management Plan (CMP) also established chimpanzee-related research bases at Yerkes and the University of Texas, as well as at Texas A&M in College Station and at the University of Pittsburgh. The International Species Inventory System monitors the status of all the captive chimps. In 2013, under intense pressure from organizations and the public, the National Institutes of Health announced it would retain, but not breed, a colony of up to 50 chimpanzees for potential use. The remainder of the chimps would be designated for retirement into the Federal Sanctuary System. Write to your U.S. Representative and your two U.S. Senators and tell them that you do not want your tax dollars spent on animal experimentation. Write to The Honorable __________, U.S. Senate, Washington, D.C. 20510; The Honorable __________, U.S. House of Representatives, Washington, D.C. 20515. Do not patronize zoos and other forms of animal entertainment.